Today is an incredible day. A bright blue Buffalo day, the kind you get only in October. I was just walking around Delaware Park and I could not get over it. I wanted time to stop so this sky can stay this incredible blue forever. I took the above picture from my back porch when I got back but it does not do the day justice. The whole morning was incredible. At Mass the sun was shining in through the windows of St. Anthony's, this blinding sunlight, and it made everything seem mystical. You could see the mists of incense in the air. Today's theme was wonderful too. Quoth the missal: "The Mass of this Sunday reminds us that all men are called to heavenly reward and happiness." And please, nobody tell me it says men and not women. Not having fallen off a turnip truck I know that it means women too. Here is a line from today's Mass I love. "Ecce prandium meum paravi, tauri mei et altilia occisa sunt." It means: "Behold, I have prepared my dinner; my beeves and fatlings are killed." Those are wonderful words, beeves and fatlings! I am a fatling these days, that is for sure. That is why I was walking around the park. I went around the Ring Road twice! Because I am a fatling. Anyway, Mass was a beautiful start to this beautiful blue day. Here is something else I should mention. I am having a Mass said for Leonard Pennario a few Sundays from now. I requested it months ago and suddenly it is almost here! It is October 25. At 9 a.m., at St. Anthony's, the church where he was baptized. It is old Catholic tradition -- a calling really -- that Catholics pray for each other's souls. That is why you have Masses said for people after they die. These days you might hear that when people die, they go straight to heaven. Catholics do not believe that is generally true. We believe that most people go to Purgatory first where they are purified. Purgatory is not a comfortable place and that is why you pray for people you were close to or who touched your life in some way. You ask God to have mercy on their souls. 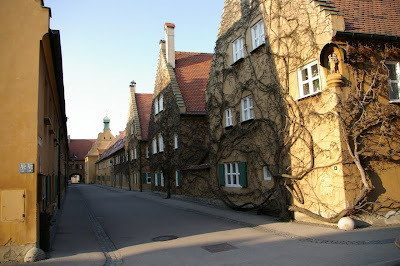 Speaking of which, the Wall Street Journal ran a story a while ago about a place in Augsburg, Germany, called the Fuggerei. That is a hilarious name! It was named after a wealthy family of bankers named Fugger. You would say it in German FOOG-er. What happened was, Jakob Fugger the Younger, who had the great nickname of "Jakob the Rich," had this idea in the 1500s to build this enclave where down-and-out Catholics could stay while they got back on their feet. They could stay there free as long as they prayed for the banking family's dead. The Fuggerei is still open for business! Here is a picture of it. Here is a funny thing: One of the people on record having stayed there was named Franz Mozart. It was Wolfgang Amadeus Mozart's great-grandfather who was an out-of-work bricklayer at the time. He stayed there for 13 years! Mozart's father, Leopold, was from Augsburg. Here is another funny thing. The Wall Street Journal kept having fun suggesting that this was a weird idea, this condition that whoever stayed in this community was asked to pray for the dead bankers' souls. It was clear that whoever writing the story had no idea that this is common Catholic practice. It is what we do! So that is what we are doing October 25, praying for Pennario's soul. Knowing Pennario's love for the Latin Mass I made sure to get him a Mass in Latin which is why it has taken so long. So, save the date, Oct. 25. Everyone is welcome! Hmmm. Speaking of everyone being welcome I am reading about the Fuggerei. It was painstakingly restored after being bombed in World War II and they have 150 apartments. I wonder if I could go stay there while I finish my book! I do not mind praying for the dead bankers' souls. Let's go! They might have some cool yard sales there too! Larry, haha... I am seeing this comment years later! The Fuggerei might see me yet!